This is a revolutionary new product that provides you with the warmth and comfort of a fire while being 100% safe. No need to buy firewood, no need to keep stoking the fire, and no need to extinguish it when done with your gathering. 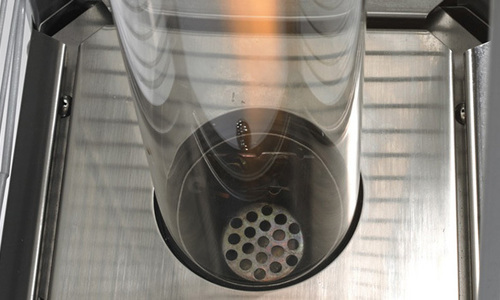 The Ambiance™ Fire Feature consists of a slender glass tube through which a flame shoots to the top, powered by propane. It is decorative, alluring and the perfect accompaniment when gathering outdoors. Now you don’t have to go through the hassle of getting wood fuel, starting a fire, ensuring that it stays under control, putting it out and having to deal with the mess. Millions of families in America resist the temptation of starting a fire in their backyard simply because they don’t want the embers from the flames being blown away by the wind to the walls and/or roof of their home or neighboring homes for that matter. This could lead to the home subsequently catching fire as a result. Yet, gathering around a fire has its own appeal. The Ambiance™ Fire Feature offers the mesmerizing glow of a dancing flame, right on the patio of your home! Now your patio heater can double as decorative feature. The glass tube conducts heat while protecting the surroundings from open flames. 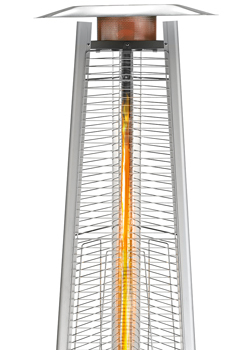 This outdoor heater is a must have for year-round backyard gatherings(BBQs, parties, etc). For hotels or restaurants Ambiance has commercial versions of their outdoor heaters available, so they can offer their guests that same unforgettable experience. You can decide the height of the flame by adjusting the gas supply. The Fire Feature fully meets all safety standards, and the propane gas tank is the only thing you need to replace when it runs out. Because no one wants to see a gas tank that looks so oddly out of place when having a ‘by-the-fire’ experience, it is conveniently concealed within the base. There really aren’t many parts in the Ambiance™ Fire Feature heaters. Generally speaking, as a rule of thumb, the more parts there are, the greater are the chances of them failing and causing you to call the technician for service. This is why the Ambiance™ Fire Feature is as minimal as possible. There is a burner which produces the flame, a glass tube into which the fire is directed, and a reflective plate at the top which reflects the light and heat of the flame to those huddled around it. This is how even a small flame can recreate the fireside experience in the safety of your backyard. The rest is just the external body. Solid panels at the bottom cover the propane tank and prevent it from being seen, while the glass tube is surrounded by a wire frame to protect it against damage. With its pyramid-like shape, the Ambiance™ Fire Feature could easily pass off for a work of art in your home. The metal panels come in a choice of Arctic White, Antique Bronze, Black and Stainless Steel finishes. The Ambiance™ Fire Feature measures 7 feet and 8 inches in height, so it would be hard to store it away, which is why a lot of thought has gone into its design. It will complement your interiors when placed inside, not stick out like a sore thumb. There is also a ‘mini’ version of the Ambiance™ Fire Feature, which stands tall at less than 3 feet. A standard 5 lbs propane gas tank is recommended for use with this, while a 20 lbs tank complements the larger version. This small heater can effectively be used by itself, or as a compliment to the full size Ambiance heaters. Because these propane heaters attempt to reproduce the effects of an actual campfire, they are meant to be used only outdoors and not indoors. Although they come built in with many safety measures, the Ambiance heaters should not be used inside. Make sure you read the owner’s manual completely before operating your Ambiance outdoor heater. Whenever you and your family feel like enjoying the stars by a fire, you can wheel it outside effortlessly – there are wheels that help you do this – and wheel it back inside when done. Or you could invite your friends over for a night of fun. The Fire Feature heaters from Ambiance are an incredible addition to any patio-type setting!